DeWalt has produced some amazing tools over the years and the DeWalt DW715 is another addition to their impressive collection. Making angled cuts is not as easy as it seems when you are working on wood pieces and other materials but the DeWalt DW715 makes this look like child’s play. Professional artisans and DIYers alike will like how comfortable and easy to use the DeWalt DW715 is but when it comes to handling very large projects, this miter saw may struggle a little bit and this makes it less ideal for professionals with heavy-duty cutting projects. It fares excellently when it comes to making accurate cuts and this is one of the factors that make it appealing to DIY enthusiasts and professionals. When it comes to the price of the unit it is cheaper than other models of a similar build and cutting capacity and this was another thing that attracted buyers to it. Its combination of power, cutting accuracy and affordability make it a great addition to your woodworking arsenal and we will look at its features in detail to see if it is ideal for your unique cutting requirements. The DeWalt DW715 comes with a 12-inch blade that is backed by a powerful and consistent motor of 15A. The motor runs at a stable speed of 4000 rpm which cuts through materials effectively and with ease. With such a high cutting speed, it will take less time to cut, mold, cross cut and miter cut. As a professional using the tool for your cuts, you will be able to achieve a lot in a short period of time and this will definitely reflect in your account balance. Accuracy when making cuts is another issue that is important to professionals and DIYers and the DeWalt DW715 is as accurate as a miter saw can get. Its seamless bevel and miter adjustments make changing the cutting angle very easy and this will improve your cutting efficiency. The cam-lock locks in the correct cutting angle and as such, you will not have to set and re-set the cutting angles over and over again and this will make your cutting a lot easier. Its positive stops are used for adjusting the miter detent plate and this improves your cutting productivity and efficiency. If your work involves a lot of movements, then portability is one of the things that you look for when buying a miter saw and we are happy to report that the DeWalt DW715 will not disappoint you in this regard. It weighs just 42 pounds and as such, moving it around in your workplace will not be a challenge. Some users, however, wish the saw was a little bit lighter but for the power that it can generate the DeWalt DW715 is actually very light. Its lightweight design makes storing it very easy as well and this will guarantee its durability for the longest time possible. With all the power that miter saws can generate, injuries when using them can be quite fatal but the DeWalt DW715 has some useful safety features that are meant to protect you from injury. It has a blade guard that completely covers the cutting blade when the arm is raised and this ensures your safety when using the tool. Can the DeWalt DW715 be used on a 100V/50Hz power supply? It is recommended to use the DeWalt DW715 on a 120V/60Hz power supply for proper tool functionality. Anything less than this will strain the machine and this will affect its cutting ability. How is the warranty of the DeWalt DW715? DeWalt backs all their products with a 3-year warranty against manufacturing defects and faults. Buyers will also have their products serviced for free for one year and a 90-day money back guarantee if the product doesn’t impress them. Is the DeWalt DW715 safe to use? Yes, it is. It has a guard cover that ensures you don’t come into contact with the blade. 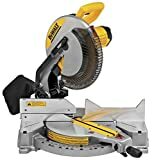 We checked online reviews to determine how the DeWalt DW715 was received and 9 out of every 10 people who used this miter saw gave it a perfect score and this means that the DeWalt DW715 was well received. Most people enjoyed how accurate the saw was when making cuts and its ability to generate enough power for different cutting needs. As we have mentioned earlier in the post, the price point for the DeWalt DW715 was a lower than that of other similar models and as such, those who bought it were able to enjoy immense value when using the saw. There were complaints, however, regarding the tool’s dust collection system with some people of the opinion that the dust bag is too small to collect dust effectively. The DeWalt DW715 also lost valuable points for lacking an LED guide for added cutting accuracy. Overall, the DeWalt DW715 got a lot of positive mentions and recommendations from its users. An enhanced cutting capacity and a compact build are some of the features of the DeWalt DW715 that will make your cutting easy and seamless. Budget buyers will appreciate its low price point that makes the DeWalt DW715 a valuable tool in your workshop. A poor dust collection system and the lack of a guide are some of the negatives that you will have to deal with but these issues should not discourage you from getting this tool for your cutting needs.